Due to the special requirements in some cases, selecting the right drive from drive catalogs is not always straightforward and can often waste valuable time. After all, the fields of application and the requirements regarding operating behavior and costs are wide-ranging. Whether the drives are used to operate pumps, fans or compressors, or to drive conveyors, mixers or kneaders, it is important to find the appropriate drive for the required range of performance and voltage quickly and easily for each of these applications. And wherever possible, this must be done without the need for expert knowledge of drive technology. 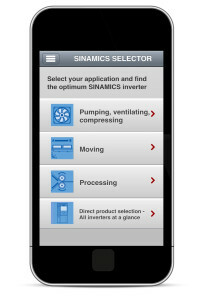 Siemens brings both convenience and efficiency in drive selection right to your smartphone with Sinamics Selector. In order to simplify this sometimes-complex process, Siemens, for example, has been offering its Sinamics Selector app free-of-charge. This is a solution that displays the entire collection of products from the portfolio of low-voltage frequency drives (Sinamics V20, G120C, G120 and G120P) on the most popular iOS and Android smartphones, and can be used both online and offline. This offline capability is of particular importance in regions that do not have full cellphone coverage. Since Version 4.0, not only has brochures, product videos and application examples been available to users and electrical distributors, but also with more language versions. As a matter of principle, when assembling the appropriate components, the Sinamics Selector app offers not only a product-specific, but also an application-specific approach. In other words: either the user knows from the outset which frequency drive is required, or the app guides the user step-by-step to the right drive by asking for key parameters. The information held by the Sinamics Selector app is kept up-to-date at all times by the central storage of data and continuous updates. After choosing the required type of frequency inverter, the rated output, device options and accessories can then be selected and adapted individually, if necessary, along with the support of the respective Siemens contact, whose details are also stored in the app. Once the components have been selected, the user has the option of either saving or emailing them. To make it easier for end-users to get in touch later, the headers and footers of the email can be adapted individually with personal contact information. The overview includes actual part numbers for all of the selected components. This can be used as information for the customer, but also as the basis for ordering specific components or preparing an offer at the local dealer/distributor. 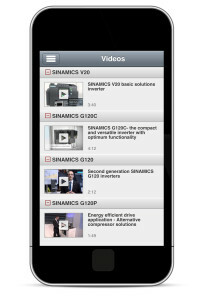 Since the introduction of the first version, the Sinamics Selector app has been installed 17,000 times on mobile devices worldwide, and the number is still rising. Apart from Europe, China and the U.S., key markets such as India, Brazil and Mexico are leading this trend. “It is particularly important in these countries to have a solution in the local language which also functions faultlessly offline. The email containing the results can be stored and then transmitted when sufficient network capacity is available again,” adds Ralf Weber from the Siemens Digital Factory division responsible for the app. The online selection is always up-to-date, available in many different language versions and saves the user time laboriously poring over catalogs will become a thing of the past.